Although feeling “emotional” at the launch of Seamus Heaney HomePlace, the poet’s son and daughter said they were “incredibly impressed” by the monumental building. Snuggled into the hills of Bellaghy, the impressive barn-like building cuts a striking figure as you enter the small village. But far from being too small for such a momentous project - which some might say would better fit a city - Michael and Catherine said it was just the right place for it and that any qualms they had about the project - just three years after their dad’s death - “evaporated” at the final reveal. The brainchild of Mid Ulster District Council, the £4.25m building was designed to celebrate the life and literature of the Nobel Laureate. Just inside, you are greeted with two striking images of Heaney, both as a boy, and then the man most of us will remember. 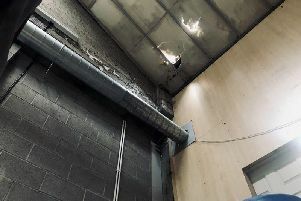 Mid Ulster Council Chair Trevor Wilson told the Mail these images were his favourite part of the building, which he says has something for everything in the community. Welcoming journalists from all over the world for their first glimpse of HomePlace, he said: “From the day of its inception, this project would not have been possible without the tremendous support and close involvement of the Heaney family. But family members have passed on credit for the impressive ode to their husband and father. But, alluding to his father’s grace, Michael said, he might also “have been a bit nervous about it”. “He would have understood the need for it and the desire among the people of Bellaghy to commemorate him,” Catherine added. “But as Michael said, the part of him that maybe didn’t always want to be in the limelight - the scale of it might have unnerved him a tiny bit. “But overall I think the building is incredible. Michael went on to say that he was nervous about the project so soon after his father’s passing. Inside SeamusHeaney HomePlace words take centre stage. From the impressive hanging mobile of lyrics he used in his poems, to the inspirational and educational phrases emblazoned across walls throughout, Heaney’s tools are the star of the show. And if you search hard enough, you can even read the last poem the master wordsmith wrote - the uncollected In Time for his granddaughter Siofra. It was penned on August 18, 2013. As for whether Bellaghy was the right place for the literary centre, neither Michael, Catherine or centre manager, Seamus Heaney’s nephew, Brian McCormick had any doubts. “Even though dad hadn’t lived here for many decades, in a way this area is home to the poems, home to the poetry and so in that sense, it absolutely makes sense to have this centre here,” said Catherine, while Michael said was the “logical choice”. “This was the only place for it,” said Brian. “Seamus Heaney himself returned time-and-time again for so much inspiration for his works. Asked if his relationship with the Nobel Laureate help him bring anything special to his role as centre manager, he added: “I am very proud of the fact that Seamus Heaney is my uncle. “To be lucky enough to take on this role, managing SeamusHeaney HomePlace, is one that’s very very special to me and it’s one that I’ve enjoyed the last number of months.